The temple at Segesta served as a good introduction to Doric temples. Because it is unfinished, it lacks ornament and refinement, such as a friezes and fluting, that might distract from the essentials of its construction. Regarding its unfinished nature, it is entirely likely that the people of Egesta began building this monument to impress the Athenians who were coming to assess their assets, and then stopped as soon as the trick had been completed. It was just so cool to see the effects of what we were reading in class over two-thousand years after the events documented by Thucydides. Back to why this temple is such a good template, the monument displays all of the characteristic features of the Doric style of the day, in which all of the temples we saw were built. It is six columns wide by 14 long, almost the desired proportions, which are an even number of columns wide (x) by 2x+1 long. These refined proportions and smaller echini help to date it to later in classical Sicily, around 420 BC. It still has pieces of stone jutting out of the base (the crepidoma) that would have been used to lift and transport the pieces. Also, one of the things I found most interesting about this temple was that its base was not flat. In fact, it was far from flat. Counterintuitively, this was done in order to give the structure a normal appearance on the hill. 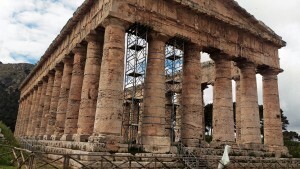 This tendency to distort proportions in order to make this look proportional extends to the spacing between the columns and the entasis of the columns themselves. This irregularity is in fact fairly normal for these temples.